Proper used Soviet officer's field boots, a nice pair of traditional military / old time footwear, these look like they've troddled through Ukraine or something. Made of thick and strong leather with nailed-on sole & rubber traction sole. One-off pair! 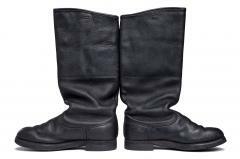 Russian leather boots are usually made of very strong materials, with a traditional look to them. These extend just below the knee. Inside the shaft these have a partial leather lining. This kind of quality cannot be found these days from any store, you would have to order a custom pair. The size is 41 (262 mm), with a Russian "normal" last. User's recommended foot length 262 mm. Measure yours by placing your foot on paper and drawing the outline. Then measure the longest distance from heel to toe. The total inside length of the boot is about 262 mm. 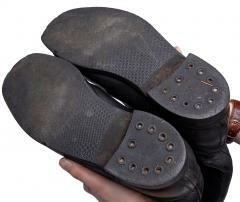 No insoles included, get a pair immediately. 38 cm circumference on the mouth of the shaft. Height from ground to top 42 cm. Used, with the most wear on the rubber of the nose part, look at the photos. These are so used that they have the coveted, fashionable "accordion wrinkles" on the shafts! Apart from the worn soles these are supple and nice. 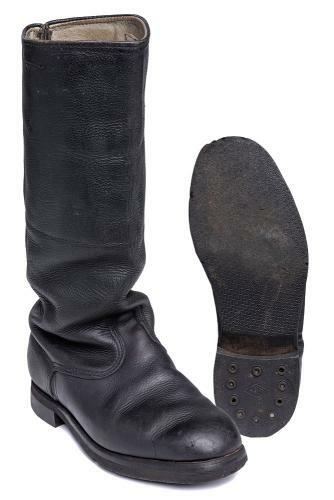 We occasionally get random pairs of Soviet/Russian boots in stock, these are sold as one-off pairs so you know exactly what you get.